As London EdTech Week kicks off, Angus Reith, Computing Lead at Plymouth School of Creative Arts explains how his school is exploring the use of artificial intelligence to empower students. In September 2016, we started a collaboration between Plymouth School of Creative Arts (PSCA) and iDAT - an Open Research Lab - through a ‘Creative DataLab’. From this initial workshop grew what Emoti-OS has become today. Emoti-OS speculates whether a chatbot (a computer program that mimics conversation with people using artificial intelligence), with a visual and emotionally-driven character, could engage and reflect the collective mood of a school in real time. Whilst doing so, we asked whether it could also act as a channel for pupils and staff to express how they feel and see how others feel about their learning environment. We pitched the idea at DataPlay 6 – a Plymouth City Council initiative set up to do creative things with open data -who provided us with funding. This was match-funded by i-DAT and we were able to build the first prototype. A user can interact with Emoti-OS through two interfaces. 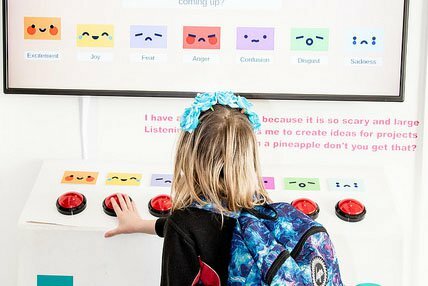 The first is a physical installation in the school atrium where pupils can select an emoji button that represents one of the seven system emojis (joy, sadness, excitement, fear, confusion, anger and disgust) to which they most relate. Secondly, users can chat with the online chatbot at Emoti-OS.me, where once they have selected a representative emoji of how they feel, they can engage Emoti-OS in a deeper conversation about why they feel this way and other aspects of school life. Pupils in the school can also pose questions to their peers through Emoti-OS. Although we didn’t set out with a problem to solve, it became apparent that with Emoti-OS we were empowering students to give voice to their feelings and, in many cases, giving them an opportunity for non-human, non-judgmental conversation. What was the initial reaction from teachers and students? 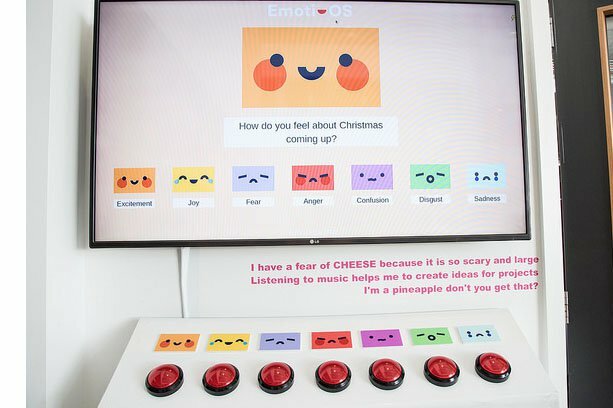 In the four days following the launch, staff and students interacted emotionally over 10,000 times with Emoti-OS, and had 500 conversations about how they were feeling about a range of issues. Emoti-OS 1.0 ran in our school for four weeks prior to Christmas 2017 and, during this phase of the installation, users were asked a series of question such as 'What would make the school a better place? ', 'What or who inspires you? ', 'How could sharing your emotions with others make things better?' and 'How do you feel about your future? ', giving students the opportunity to voice their opinions in a non-judgmental and anonymous way. This approach also allowed our safeguarding team to follow up concerns picked up through our built-in AI safeguarding alert system. Emoti-OS 2.0 was exhibited at Tate Modern in Jan/Feb 2018 as part of the Tate Exchange 'Factory Settings' programme. This aimed to gauge the collective mood of participants at the three-day event, who were directed to 'clock in' to Emoti-OS between workstations and chat to Emoti-OS about themes of 'Production', disrupting the linear model of education, and about the wider Tate Collection. Emoti-OS 3.0 was installed in our Year 2 studio (6-7 year olds) for four weeks to support their introduction to PSHE and to develop emotional literacy among the age group.There have now been 40,000 emotional interactions and over 1,500 conversations, meaning that there is ongoing engagement from students – in fact, they seem to have a much more intuitive understanding of the system than the teachers. It became apparent that, with Emoti-OS, we were empowering students to give voice to their feelings and, in many cases, giving them an opportunity for non-human, non-judgmental conversation. What have been your biggest lessons from introducing the system? Kids really chat to it; they have warm, genuine, thoughtful conversations. I don’t think we expected that. It provides this completely non-judgmental sounding board; even just the process of chatting to it seems to be therapeutic for some children. We’ve got a broad spectrum of young people with additional needs in the school and this has been quite a revelation – for some of them, checking in with the chatbot was the first thing they were doing in the morning and the last thing at night. We’ve also learnt that the collective mood of PSCA oscillates between joy and excitement – exactly the atmosphere in which I wish my own child to learn. Can you see AI such as this being taken up in other schools? It uses cheap technology (Raspberry Pi and Arduino); it’s based largely on software that’s free for educational projects (Dialogflow provides a machine-learning and natural language processing technology, NodeRed ‘wires’ the hardware and software and IBM’s Watson analyses the sentiment, or tone of the conversation). 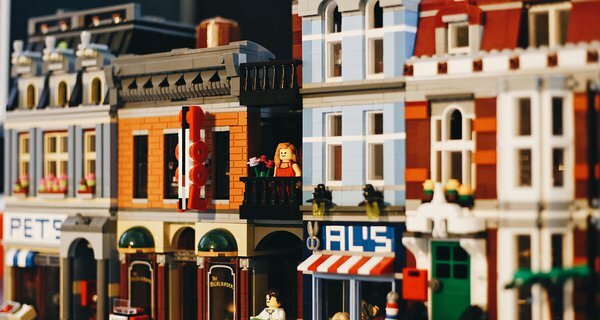 As a model, Emoti-OS is an example of the way that schools can take ownership of the development of their own AI systems and feel empowered to experiment with data and technology. In this way, schools can work with their pupils to be creators of technology, not just consume it. What are the challenges to introducing AI into schools? Is there any way to address these challenges? Artificial Intelligence is really a concept – a notion of computer systems that can learn and think. An application of AI is Machine Learning, which is based on algorithms that can learn from patterns in datasets beyond being programmed specifically to do so. Artificial neural networks and Deep Learning are pushing the realm of AI into new territories, but as these systems increase in complexity, they become less accessible to the public (and young people in schools) and it’s self-serving for tech companies to perpetuate this situation. Therefore, schools need to understand that they can build and develop systems like this themselves, collaboratively, alongside students. What does the classroom of the future look like to you? 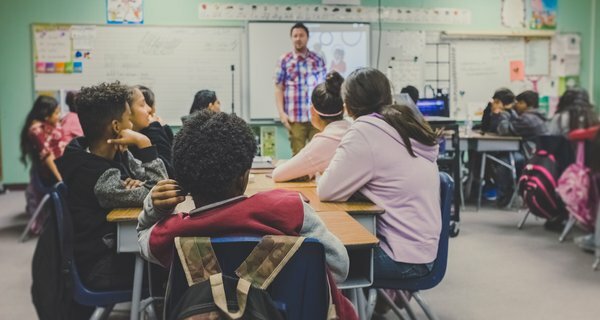 Angus Reith, Computing Lead at Plymouth School of Creative Arts, will be joining a panel discussion at Nesta on 20 June during London EdTech Week to exploring why teachers shouldn't be afraid of AI.